We offer a range of accommodation at Mt Glorious, giving you the choice of cosy cottage or spacious B&B suite. From the moment you enter your private space, you will feel yourself relax. All our accommodation is designed to ensure privacy and seclusion for our guests. Turkey's Nest is perfect for an intimate and romantic escape, or a family weekend of bush walking and bird-watching. • Binoculars and bird books for bird-watching. Owing to the steep topography of the property, it is unfortunately unsuitable for people with disabilities. Turkey's Nest is a member of the Land for Wildlife scheme. As such we cannot accept pets. 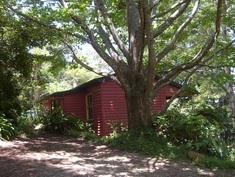 Rose Gum Cottage. 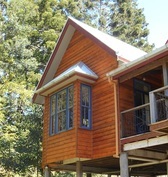 Our new cottage, built in 2011, offers a touch of luxury, with a large attic bedroom and a relaxing claw-foot bath. Nestled on the edge of the forest, it is a favourite romantic retreat for honeymooners. 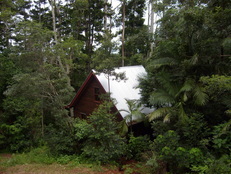 White Gum Cottage. Our original cottage, a former forestry cottage, has no pretensions of grandeur, yet its old-world charm continues to weave its magic on many of our regular guests. Macadamia Rainforest Suite. Totally private and self-contained, our spacious queen bed suite opened in mid-2014. The four-poster bed, decorative ceilings and relaxing claw-foot bath offer a touch of luxury. Bookings cancelled more than fourteen days ahead of arrival will receive a full refund, less a processing fee of $20. Bookings cancelled within fourteen days of arrival will incur loss of deposit. This may be waived at the discretion of management if the accommodation can be re-booked. In the case of a refund, a processing fee of $20 will apply.